Allen Ramsey Photo. Highlands sophomore Kayla Nehus (left) takes a shot and scores past Dixie Heights defender Payton Sturm (right) in Monday's 9th Region contest. Highlands won 3-2. The Highlands Ladybirds soccer team won its second straight with a 3-2 win at Dixie Heights on Monday. The Highlands Ladybirds soccer team recorded a big 1-0 victory at Woodford County on Saturday. 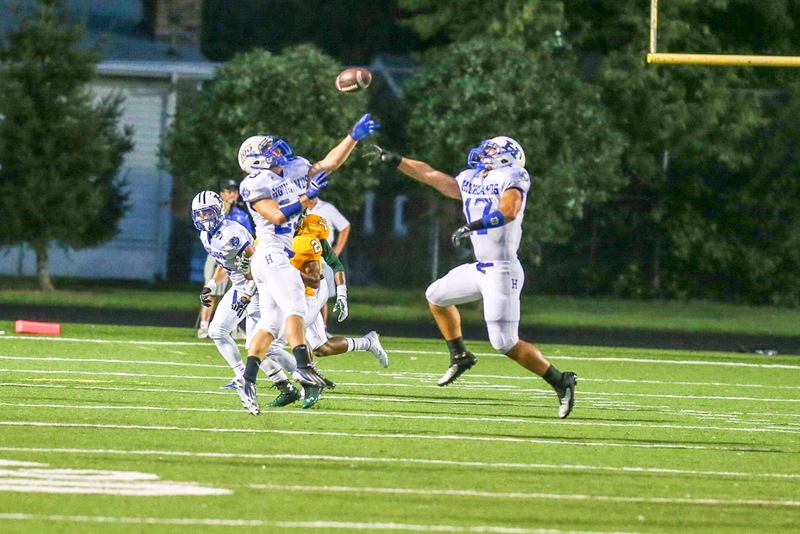 How did the Highlands-CovCath game turn out Friday? Allen Ramsey Photo. 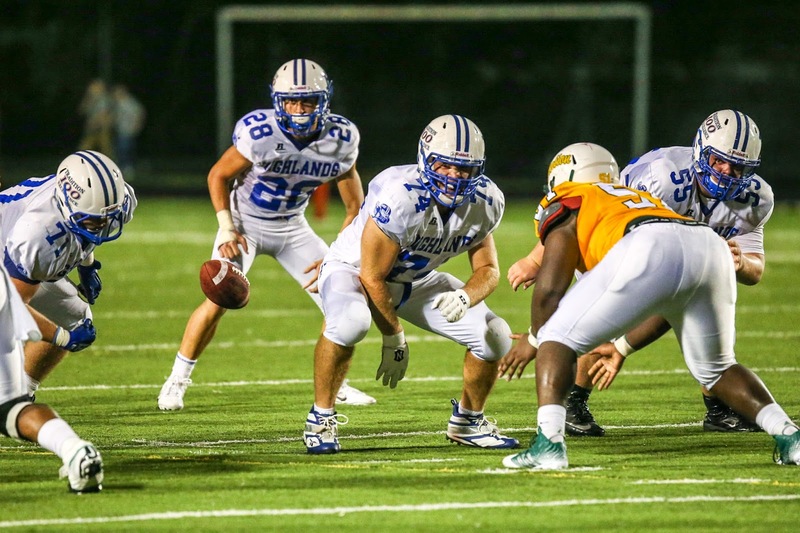 Highlands senior linebacker Patrick Schoepf (33) puts pressure on Covington Catholic quarterback Adam Wagner (19) in Friday's game. The Bluebirds won 42-7. The hopes of it being ‘the year that’ things turn around in this series rise like crazy just before the season begins up until the game in Park Hills. Allen Ramsey Photo. The Highlands student OZone section cheers on the Bluebirds in their 42-7 win over Covington Catholic on Friday. 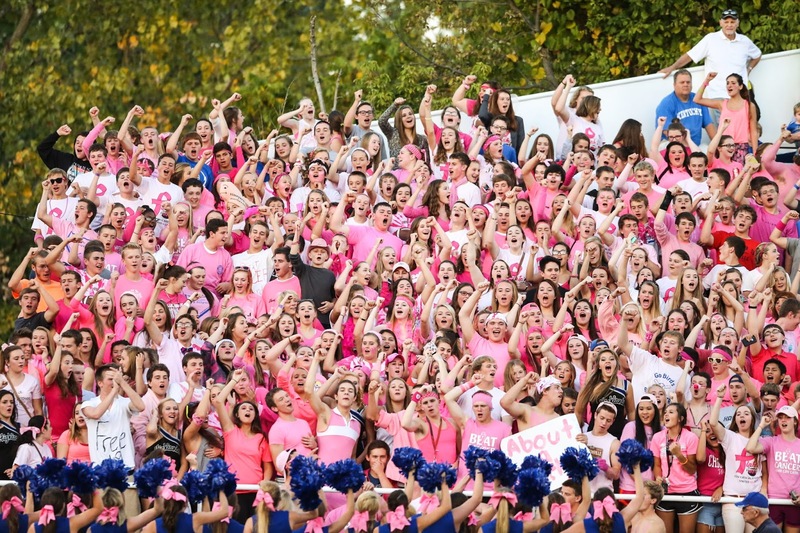 The Pink-Out signified the community's commitment to Breast Cancer and finding ways to beat it. Allen Ramsey Photo. Highlands running back Grant Murray (24) looks for room in Saturday's junior varsity contest against Covington Catholic. The Highlands JV won 34-20. When asked whether it is still a rivalry or not, Highlands senior cornerback Andrew Abner did not hold back his thoughts. Did NewCath earn its first win of the season? G. Michael Graham Photo. Newport Central Catholic running back Jacob Smith looks for room in the recent game against Dixie Heights. Smith rushed for 146 yards and a touchdown in NewCath's 28-0 blanking of Lloyd Memorial on Saturday. When the dust settled, the team with more success recently left with the victory. The Newport Central Catholic Thoroughbreds volleyball team (10-9) edged above .500 with a 3-0 (25-16, 25-13, 25-8) win over Covington Holmes on Thursday. 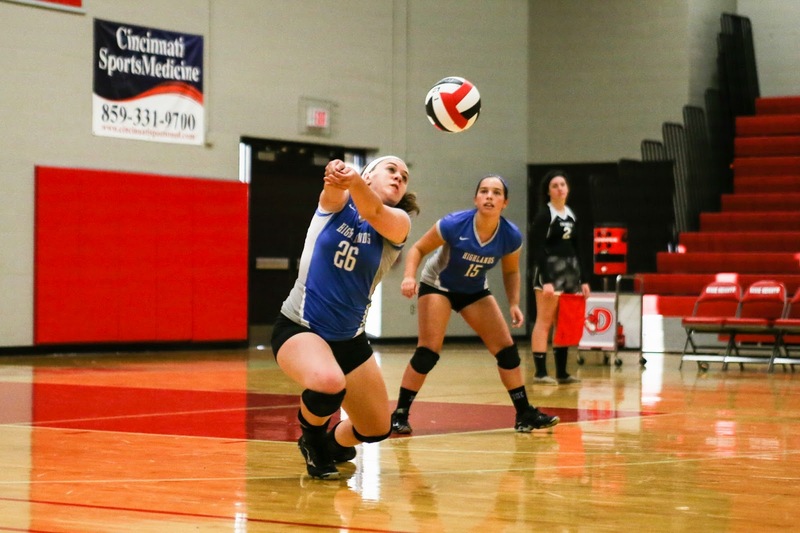 Rachel McDonald led NewCath with 11 kills and Keyaira Lankheit had seven kills and five blocks. Teammate Amanda Ruwe had 12 digs and Mikah Freppon added 24 assists. 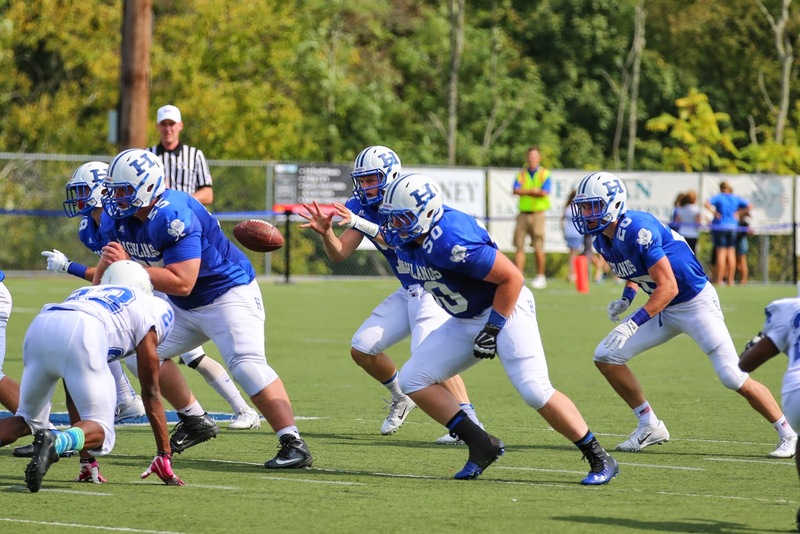 What will it take for Highlands to record a dozen straight against CovCath? Allen Ramsey Photo. Highlands quarterback Beau Hoge (center) takes the snap while offensive linemen Lou Bunning (50) and Bo Hebel (55) get in position and running back Josh Watson (right) makes his move. 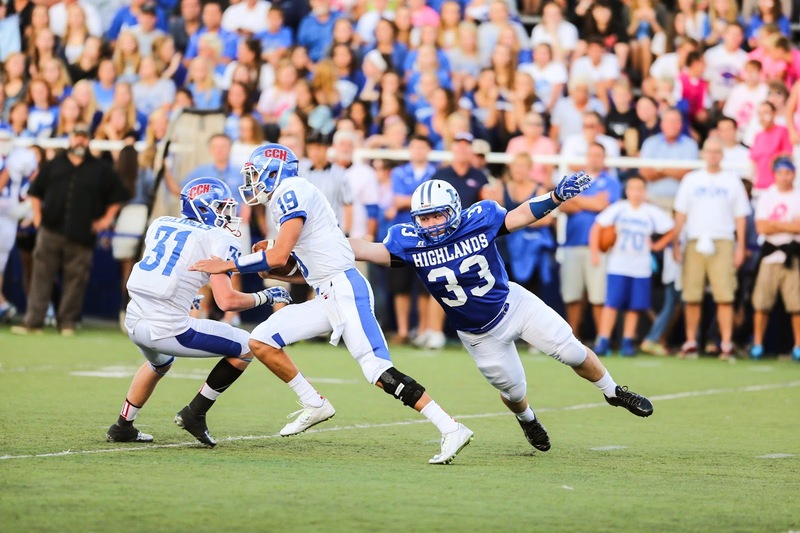 Highlands hopes to win its 12th straight against arch-rival Covington Catholic on Friday. Over in Park Hills, the faithful fans constantly wonder if this is the year the streak ends. Why are the NewCath, Lloyd records potentially deceiving? G. Michael Graham Photo. Newport Central Catholic's Job Freppon (24) and Luke Kues (7) pursue Dixie Heights quarterback Drew Moore (7) in Saturday's loss. The Thoroughbreds open district action Friday at Lloyd Memorial at 7 p.m. It is a case of the looks on paper being potentially deceiving. The defending Class 2A state runner-up Newport Central Catholic Thoroughbreds enter the game in Erlanger on Friday winless at 0-4. On the other side, the upstart Lloyd Memorial Juggernauts come in confident with an undefeated mark of 4-0. Game time is 7 p.m. Friday. Did the Highlands boys soccer team make it seven straight against Cambpell County? G. Michael Graham Photo. Highlands junior Jason Schreiber (15) prepares to for a throw-in during Wednesday's game at Campbell County. ALEXANDRIA – The Highlands Bluebirds boys soccer team had been riding a defensive high in recent games. The Highlands Ladybirds volleyball team handled the Lloyd Memorial Lady Juggernauts, 2-0 (25-13, 25-7) on Tuesday in 9th Region action. UNION – It may not have been the desired result. But the Highlands Ladybirds soccer team tied the host Ryle Lady Raiders, 1-1 Monday. 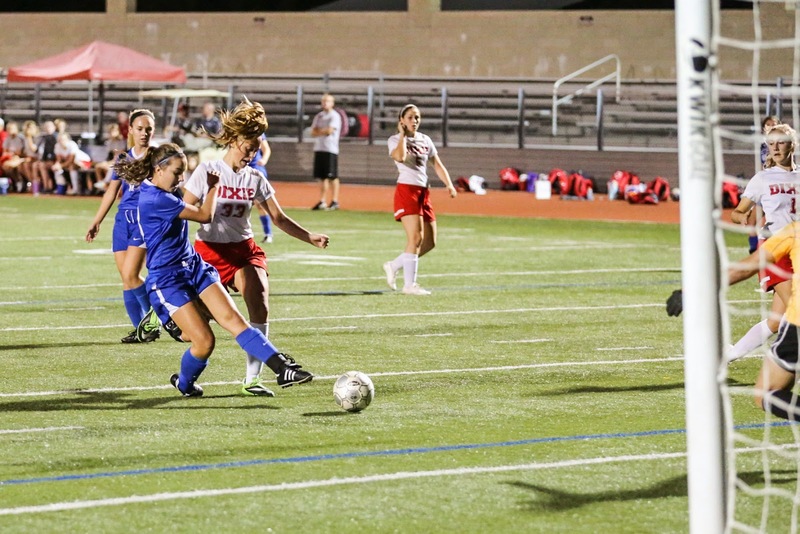 Highlands (4-8-1) actually missed numerous chances to take the lead in against the Lady Raiders (10-1-1). Why should the Highlands, NewCath communities enjoy the continued football success? Allen Ramsey Photo. The Highlands football team enters the field for Saturday's game against Paducah Tilghman. Former players formed a tunnel to the home sidelines reminding them of the years of success. Saturday marked a day I will never forget. I was glad to attend the 100th season celebration with my wife and see what has made the Highlands Bluebirds football program consistent throughout the years. The all-time record of 859-227-26 that is the second-winningest in the country has been built on a solid foundation of dedication, hard work and great family values. Those three things are something that Highlands does not take for granted as portrayed with their state-record 22 state championships. The same can be said for the Newport Central Catholic Thoroughbreds and their five state championships. Allen Ramsey Photo. Paducah Tilghman junior quarterback Jessie Dunigan (12) feels the heat from Highlands defenders Daniel Kremer (behind), Brady Murray (18) and Tyler Robinson (54). Kremer recorded two sacks as Highlands won 49-17. The list of disadvantages the visitors had coming into the game was not a secret. The Paducah Tilghman Blue Tornado football team still owns the fourth-most wins all-time in Kentucky history with 751. That’s behind only the host Highlands Bluebirds (859-227-26 overall in their 100th season), Louisville Male (837) and arch-rival Mayfield (823). It does not look great on paper. The Newport Central Catholic Thoroughbreds football team fell to 0-4 on the year with a 34-13 loss to the 3-1 Dixie Heights Colonels on Saturday at Newport Stadium. But they went 0-4 against a brutal stretch of competition from Classes 5A and 6A last year and still finished Class 2A state runner-up. 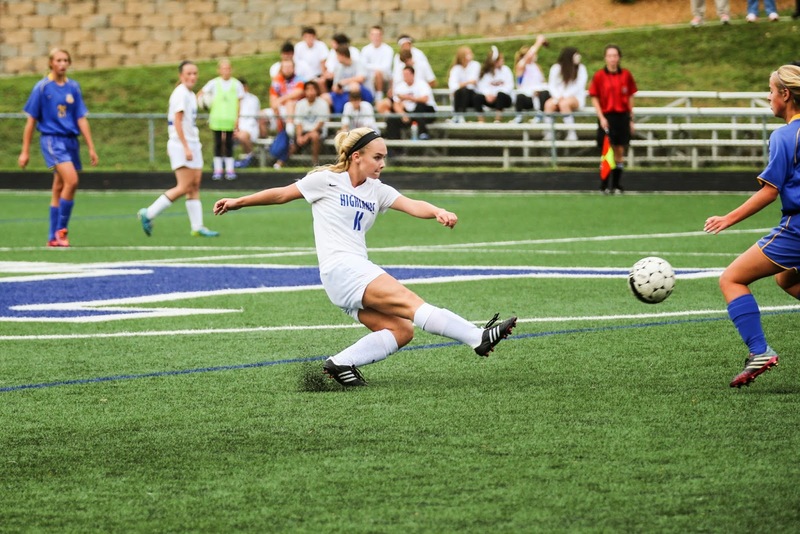 The Highlands Ladybirds girls soccer team (4-8) finished seventh in the Lexington Catholic Cup with a win Saturday. The Newport Central Catholic Thoroughbreds boys soccer team (7-5-3) bounced back quickly from the Wednesday loss. Allen Ramsey Photo. Highlands senior linebacker Jacob Noe (29) hones in on John Hardin running back Antonio Ayers (center) in Friday's game. The Bluebirds take on the Paducah Tilghman Blue Tornado at 3 p.m. Saturday. It is definitely not easy traveling five and a half hours to play a regular season football game. 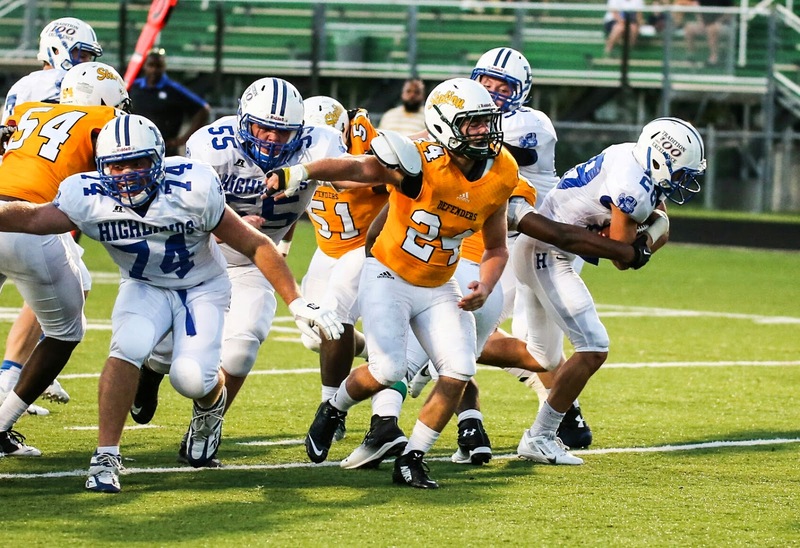 The Highlands Bluebirds did it a year ago and pulled away in the fourth quarter for a 42-27 victory over the Paducah Tilghman Blue Tornado in their first-ever meeting in Paducah. In their case, it also did not help that one of the three busses that took the team there broke down after the game. Many may be saying they’ll benefit from playing bigger schools like past teams have done. The Highlands Ladybirds soccer team continued to struggle Wednesday with another one-goal loss. Allen Ramsey Photo. Highlands junior Noah Sellers (7) and teammates battle Covington Catholic Parker Kenney for the ball in Tuesday's game at Tower Park. The Bluebirds won 2-0. 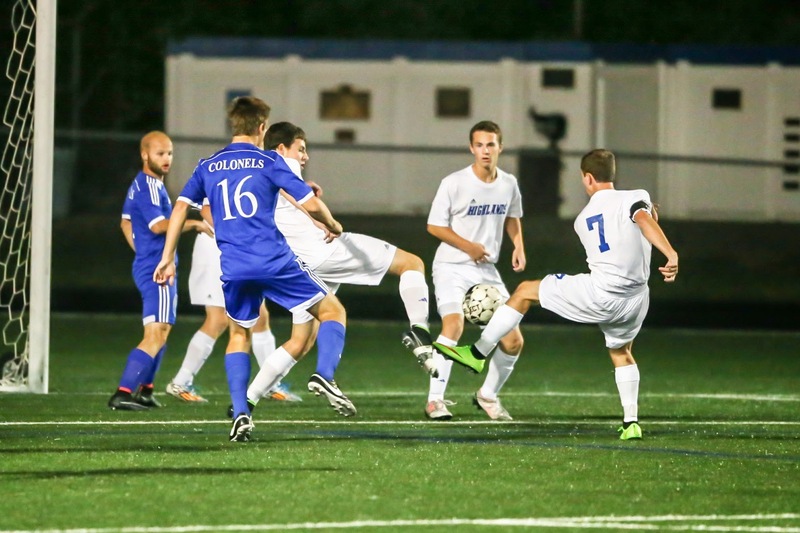 The Highlands Bluebirds soccer team recorded a huge 2-0 victory over the Covington Catholic Colonels on Tuesday. The host Newport Central Catholic Lady Breds (8-0-1) tied the St. Henry Lady Crusaders on Monday. 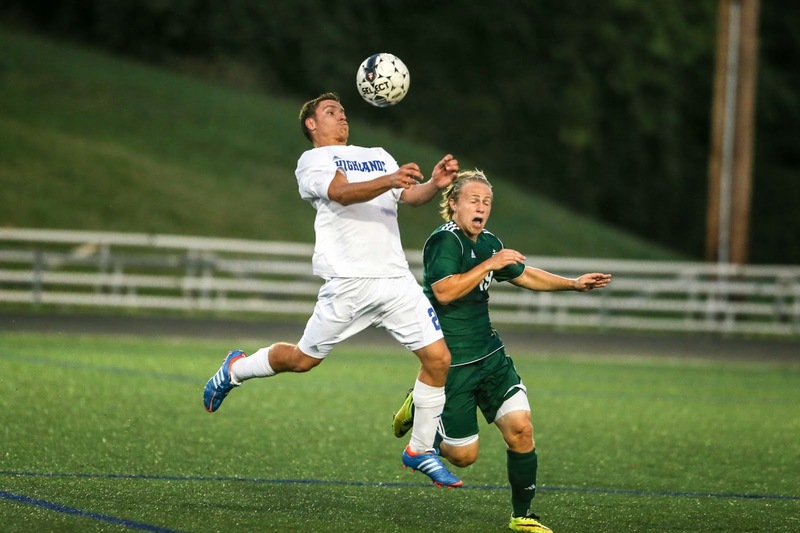 The Highlands Bluebirds boys soccer team recorded its fourth tie of the season against North Oldham on Saturday at Tower Park. Allen Ramsey Photo. Highlands wide receiver Alex Veneman (right) reaches up for a touchdown catch against John Hardin sophomore defensive backs Korie Cleveland (center) and Darian Keener (left) in the first quarter of Friday's game. Veneman had eight catches for 194 yards and two touchdowns in Highlands' 49-7 win. Some of their own faithful did not see them posting many blowouts like previous teams have done. Allen Ramsey Photo. Highlands sophomore Grant Murray (24) tries to block a punt by John Hardin senior Sean Stevens (left). The Bluebirds won 49-7 to move to 3-0 on the season. The two-year series between two teams that have been at or near the top of Kentucky for seven years ended Friday. No team has been able to slow down the Simon Kenton Pioneers so far. The Newport Central Catholic Thoroughbreds football team was the latest one in a 46-13 loss at Newport Stadium on Friday. 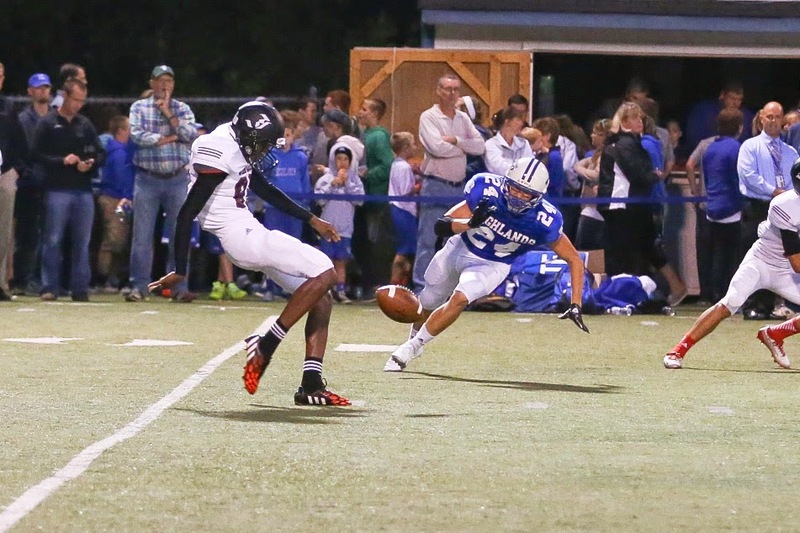 Undefeated Simon Kenton (4-0) outgained NewCath, 484-78 in total offense. 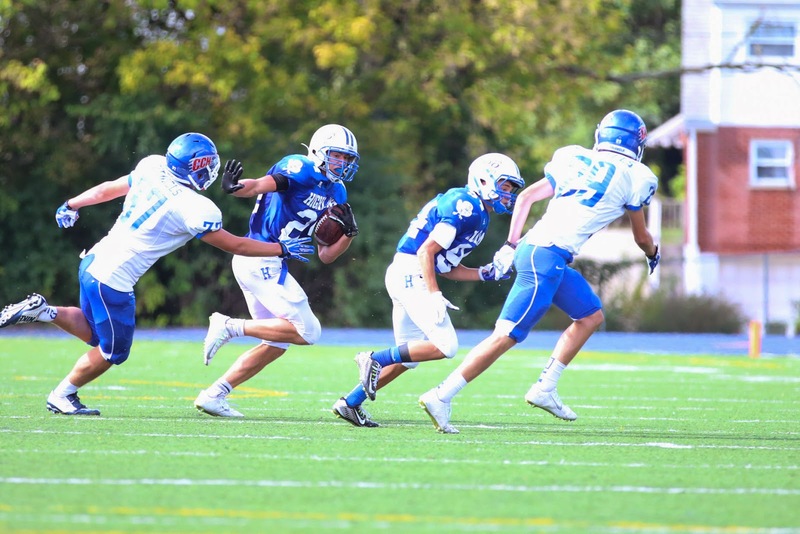 The Pioneers ran for 257 yards and passed for another 227. Allen Ramsey Photo. Newport Central Catholic's Loren Zimmerman (15) plays the ball in Friday's game against Highlands at Tower Park. 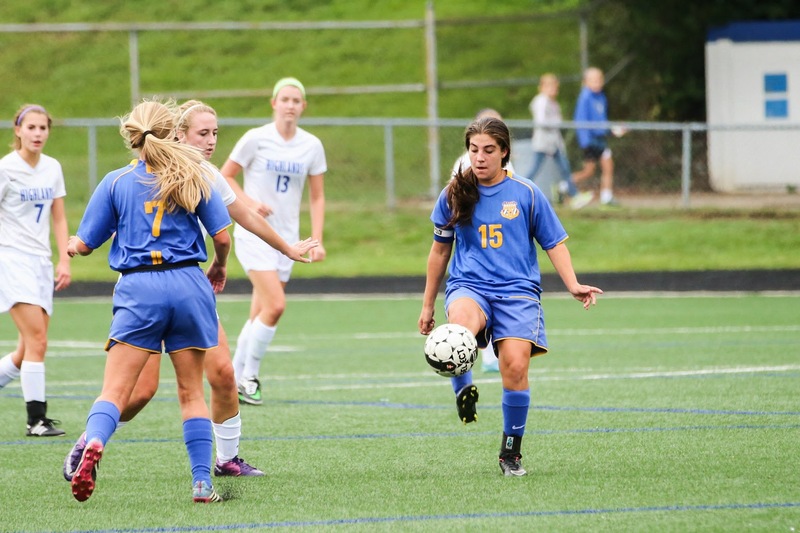 Zimmerman recorded her school record 28th career assist in NewCath's 2-1 victory. Allen Ramsey Photo. Highlands senior Taylor Vaughn (center) passes the ball in Friday's game at Tower Park. Vaughn had an assist on Highlands' only goal. The first half belonged to the Newport Central Catholic Lady Breds while the second one belonged to the host Highlands Ladybirds on Friday at Tower Park. Allen Ramsey Photo. 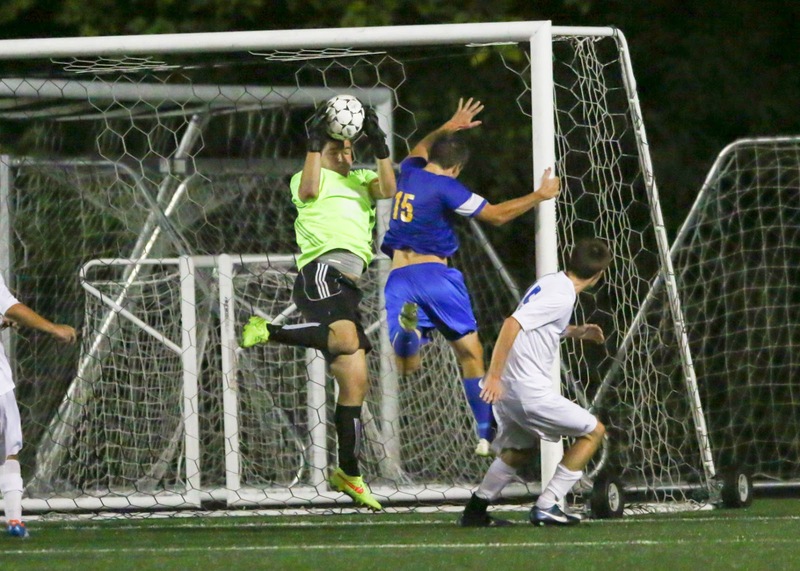 Highlands goalkeeper Nick Breslin (center) makes a save down the stretch in the Bluebirds' 1-0 victory Thursday. Both teams needed a win in a bad way. The host Highlands Bluebirds boys soccer team sought its first win of the year while Newport Central Catholic had not won since Aug. 30 over a span of five games. The Bluebirds (1-6-3) came through with that win with another 1-0 victory Thursday over the Thoroughbreds (5-4-3) at Tower Park. NewCath has not beaten Highlands in the regular season since 2004. The Highlands Ladybirds volleyball team (6-8) handled the Dayton Lady Devils, 2-0 (25-5m 25-12) in its first 36th District contest of the year. Allen Ramsey Photo. Highlands offensive linemen Matt Gall (71), Evan Richardson (74) and Bo Hebel (55) get out of their stances while running back Josh Watson (28) watches. The Bluebirds play host to John Hardin on Friday. The Highlands Bluebirds football team has many reasons to be relieved to be coming home Friday for three straight games. 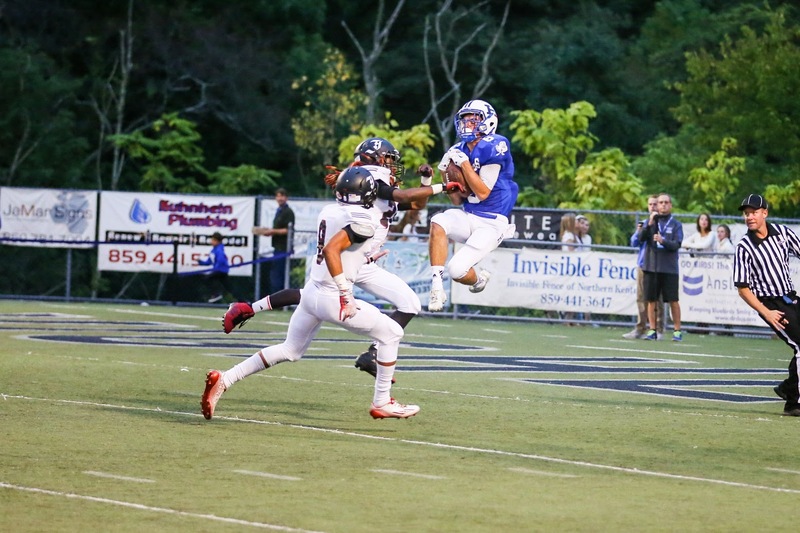 The Bluebirds escaped the road contest at Lexington Bryan Station, 47-41 last week to move to 2-0. They could easily be the opposite if various plays go against them in that game or the season-opening 23-16 win at Campbell County. The season does not become any easier Friday. The Newport Central Catholic Thoroughbreds (0-2) football team plays host to the undefeated Simon Kenton Pioneers (3-0) at Newport Stadium. Game time is 7 p.m.
NewCath saw its season-opener at Ashland rained out. The Thoroughbreds opened with a 31-0 defeat at Cooper and played much better in a 30-17 loss to Campbell County on Friday. But the underdog role does not phase NewCath. The Newport Central Catholic Lady Breds soccer team stayed undefeated with another home 9th Region win Wednesday. Allen Ramsey Photo. Highlands sophomore Lauren Epperson (5) sets the ball while Kaitlin Hall (30) watches in Tuesday's match against St. Henry. 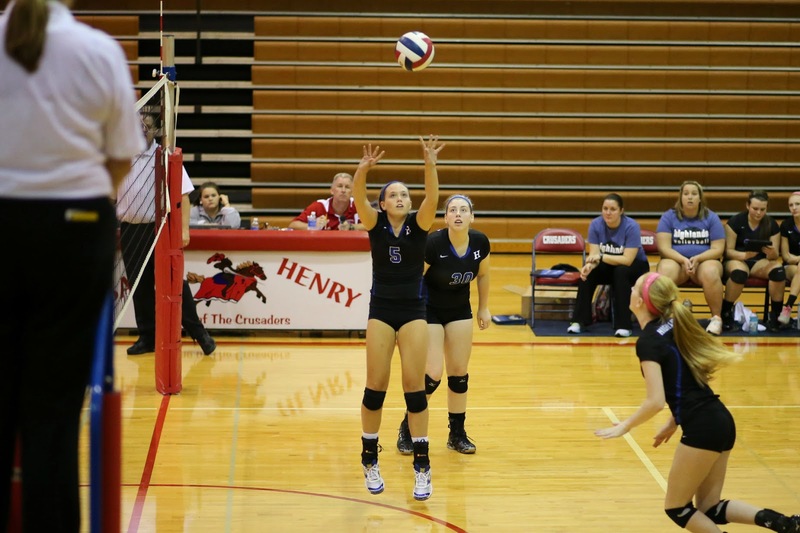 ERLANGER – The Highlands Ladybirds volleyball team learned what it will take to ultimately compete for a 9th Region title. That is not beating yourself. Allen Ramsey Photo. Highlands junior Lauren Ossege (21) tries to head one in during Monday's game against Campbell County. The Ladybirds won 2-0 to improve to 3-4 on the season. The Highlands Ladybirds soccer team won for the second time in three games with a 2-0 win over Campbell County. Highlands moved to 3-4 on the season. Allen Ramsey Photo. Highlands senior Taylor Vaughn (11) pushes ahead in Saturday's game against South Oldham. 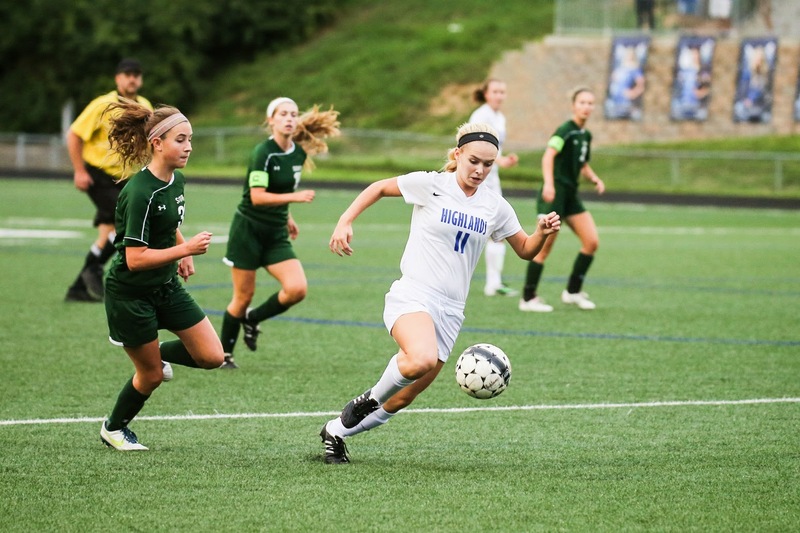 The Highlands Ladybirds (2-4) soccer team played South Oldham tough Saturday. But South Oldham came away with a 1-0 victory on a penalty kick. Highlands freshman goalkeeper Olivia McQueary made eight saves. Allen Ramsey Photo. Highlands senior Josh Waton (right) scores a touchdown in Friday's 47-41 win at Lexington Bryan Station. 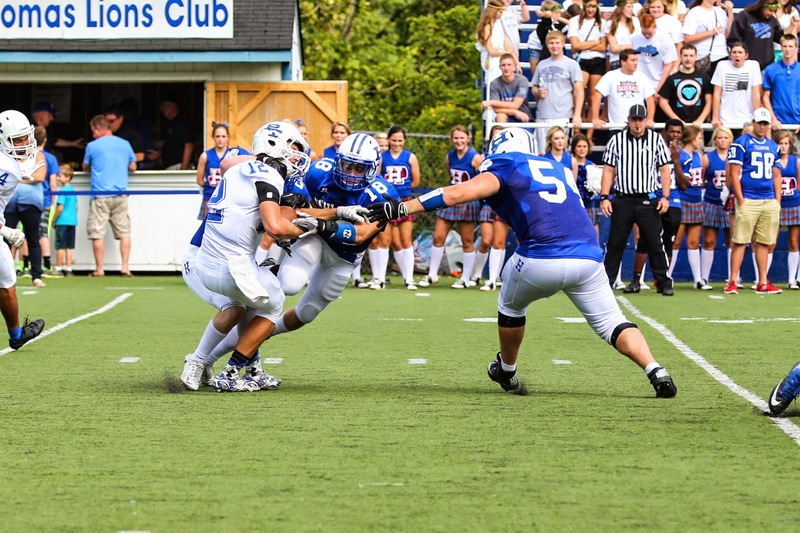 Offensive linemen Bo Hebel (55) and Evan Richardson (74) paved the way on the score. 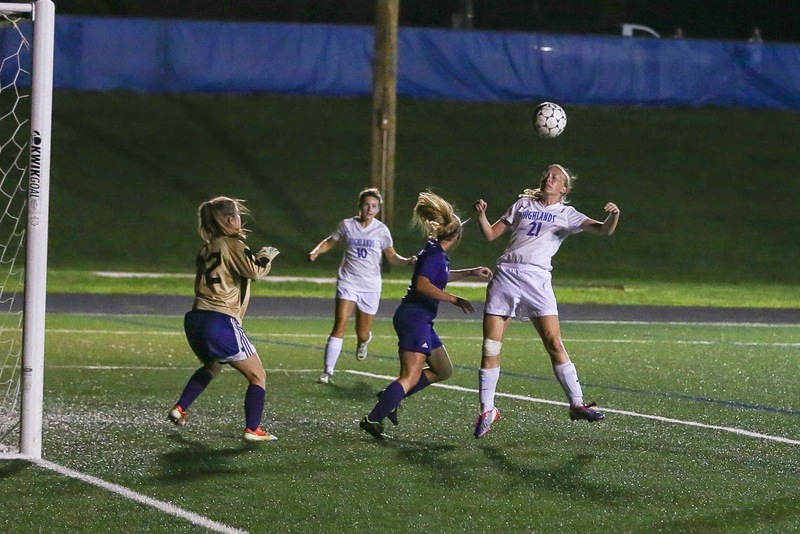 LEXINGTON – A shoot-out was expected and the teams did not disappoint. But the Highlands Bluebirds (2-0) made a few more plays in the end to escape with a 47-41 victory over the host Lexington Bryan Station Defenders (1-2) on Friday. They play three straight at David Cecil Memorial Stadium after opening with two on the road. Allen Ramsey Photo. Highlands senior linebackers Jacob Noe (left) and Rocco Pangallo (right) try to intercept a pass in Friday's game at Lexington Bryan Station. The Bluebirds beat the Defenders, 47-41 to move to 2-0. 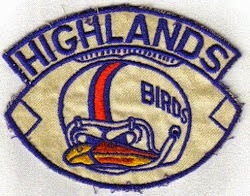 The Highlands Bluebirds football team does not trail much. But the Bluebirds had to come back from down 15 in the second quarter to beat the host Bryan Station Defenders, 47-41 on Friday. They trailed 28-13 at one point of that quarter. The Newport Central Catholic Thoroughbreds football team played better than the first game. But the Thoroughbreds (0-2) could not make the plays they needed in a 30-17 loss to the Campbell County Camels on Friday. NewCath has lost three straight in the series to Campbell County. Allen Ramsey Photo. 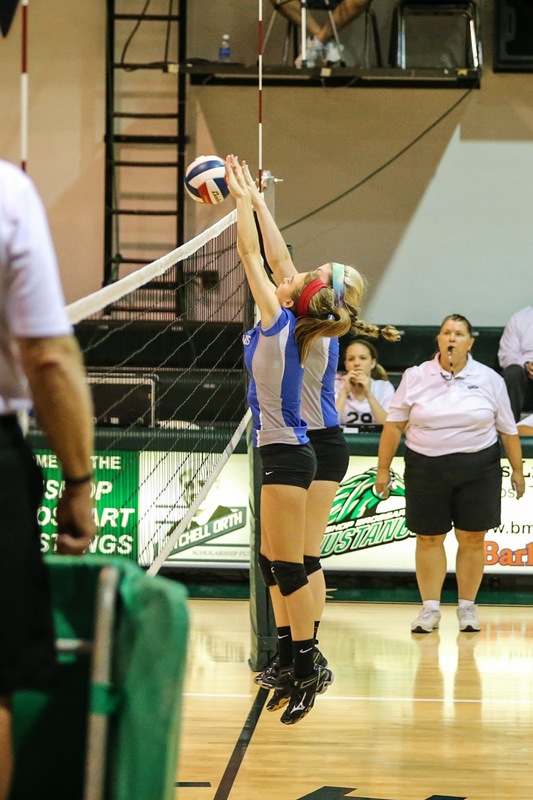 Highlands' Kaitlin Hall (back) and Maria Hockney record a block in Thursday's game at Bishop Brossart. The Highlands Ladybirds soccer team had not played in 10 days. Kentucky Athletics Photo. Kentucky redshirt sophomore quarterback Patrick Towles sets up in Saturday's non-conference game against Tennessee-Martin. Towles completed 20-of-29 passes for 377 yards and a touchdown in the win. The Wildcats play host to the Ohio University Bobcats on Saturday at 3:30 p.m.
For many falls, there has been a predominant thought around the Bluegrass State. Allen Ramsey Photo. 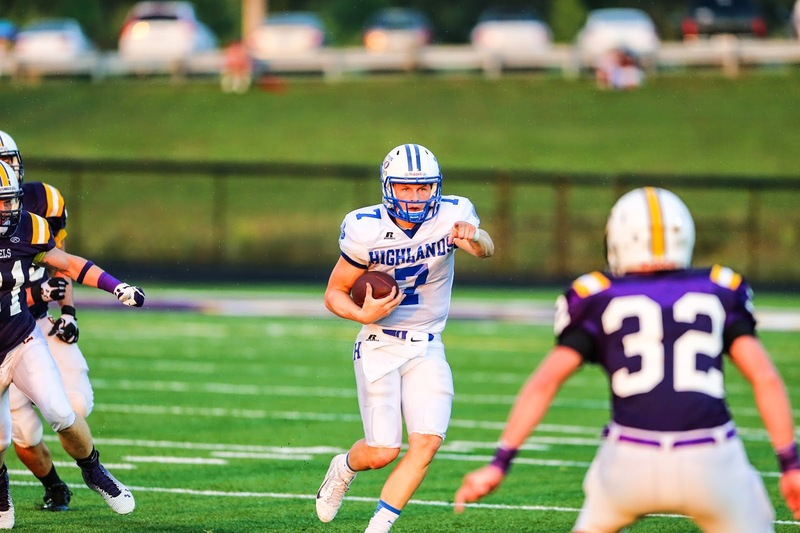 Highlands quarterback Beau Hoge (7) points ahead in the win at Campbell County. 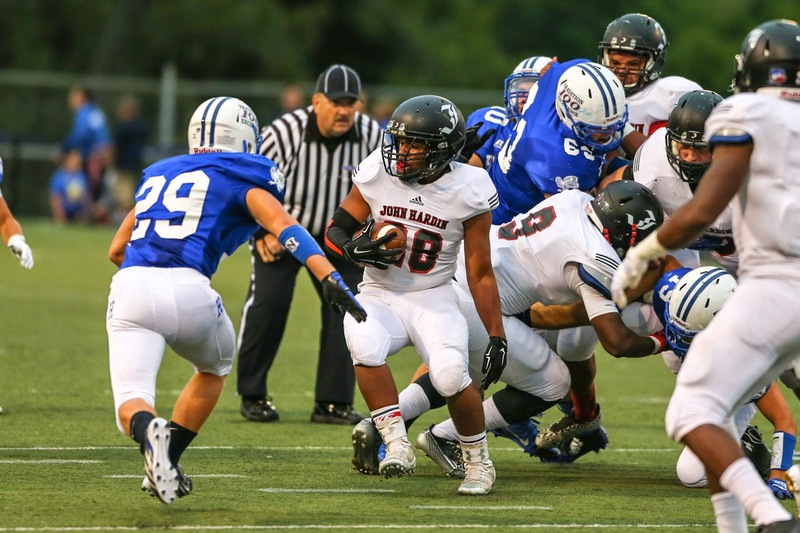 The Bluebirds travel to Lexington Bryan Station on Friday. The Blue and White have displayed similar traits to past football teams more and more each week. It may not be time to press the panic button yet. Allen Ramsey Photo. Highlands senior Vadim Lightner (left) goes up for the ball in Tuesday's game against Bishop Brossart. The teams tied 1-1. Allen Ramsey Photo. Highlands senior Lauren Maines (26) passes to the front row in Tuesday's game at Dixie Heights. The Ladybirds won their third straight to move to 3-3 on the season. The record of 0-4-2 does not look good. But that does not mean the Highlands Bluebirds soccer team is going to mail in the season. The Bluebirds are battling adversity now with several key players injured.